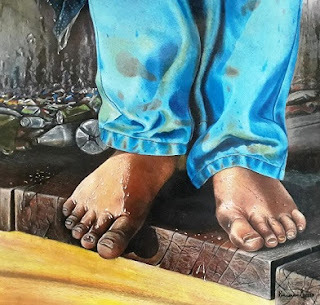 The African Art Centre will host the Footsteps of the Fathers Group exhibition showcasing charcoal, oil pastel, chalk pastel drawings, mixed medium, collage, photography and paintings. The Footsteps of the Fathers is a depiction of the roles played by fathers in our society. This theme can be interpreted in many ways and the artists confront and deal with matters relating to family politics, economics, social conditions, the past, present and more. This exhibition aims to create dialogue around the definition of a father - does the father have to be a male figure? What norms does society or the mass media dictate to us? What makes a father great? Exhibiting artists include Nindya Bucktower, Nhlanhla Chonco, Shubnum Khan, Anthea Martin, Xolile Mazibuko, Khulekani Mkhize, Major Ndlovu, Zazi Wiseman Nxumalo, and others. This exhibition is part of the African Art Centre’s Velobala Exhibition-Making workshop series, in which selected Durbanites were coached by Carol Brown (CURATE.A.SPACE) to conceptualise, administer and mount an exhibition. The curation team for Footsteps of the Fathers are Phakamani Dladla, Leevi Matthew, Phindile Mkize and Siyasanga Tundzi. Footsteps of the Fathers will be opened by Carol Brown on June 7, 2018, at 18h00. The exhibition will also include performance by Richard Ellis and the Durban Drumbeats.